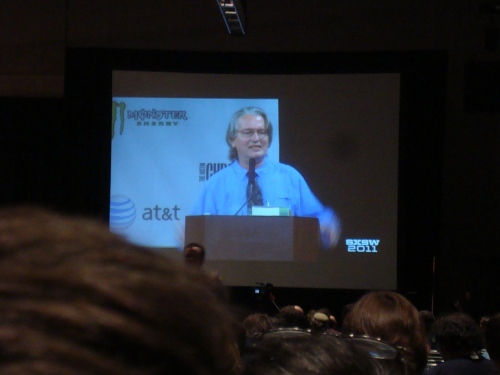 Alrighty, I’m finally back home and recovering after a marathon of tech and music that was SXSW. I’m sitting down sipping some hot tea and getting ready for a night time cold and flu Alka Seltzer bath. That’s right, I brought home lots of tech info and a cold from beautiful Austin, Texas. Hey, if you are gonna do it, you gotta go hard or not at all. At any rate I have one more day of summaries to dispatch before I start something new this year. I will go over each talk I went to into a little more depth, more for the benefit of myself more than anything else, as well as give proper respect to the . Now that I’ve fully recovered from SXSW, it’s high time I start cleaning up. The schwag mountain spilled over and caused some damage but I got it under control. 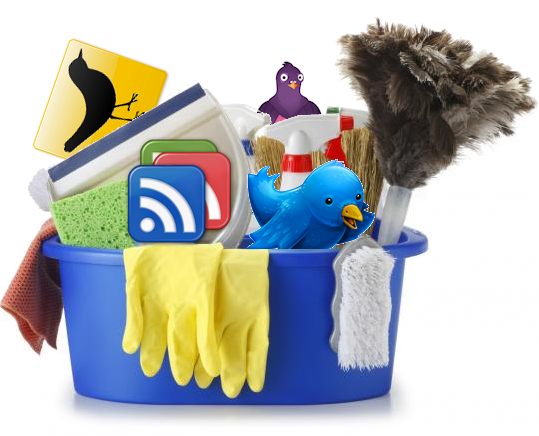 So now it’s time to spring clean my workflow and social media usage. I subscribe to this, follow that, or just end up trying to fill up big holes in my life with tiny sand distractions that it gets way too overwhelming, as I’m sure others can identify. Once I realize that, then I know it’s time to pare down my workflow and regroup. It’s not a perfect system, but when it comes time for a change I’m ready to make it. So how am I doing this? Glad you asked. If you haven’t noticed in your Google Inbox recently, there is a new feature that popped up in there. It’s called Google Buzz. What is it? It essentially takes the best of real time update technologies and integrates in with most of Google’s core group of software. I’m not going to break down the ins and outs of Buzz. But what I will do is talk about two features that I find the most attractive. One’s bringing an old favorite Google App of mine back to the forefront, the other is just stroking my ego. So let’s start with my ego first! Awhile ago I talked about the ‘@’ symbol and how it’s become the mainstream mode to reply to or address other people or systems in communication. Flash forward to today. If you notice above, the comments show the ‘@’ symbol used to address another Buzz user. Even better, once you type the ‘@’ symbol and another letter, a dynamic list of your Buzz friends and Gmail Contacts pop up for you to choose from. If you are a developer building a new app, especially one that hinges on social interactions, you will have to include this feature to be successful. Okay, the next feature that changes the game is the simple integration across all of Google’s Apps and Buzz. My Google Profile has been filled out for a couple of years and for last year I’ve been wondering why. Buzz now pushed the Google Profile to the forefront. More importantly for me, however, is the massive integration with Google Reader. If you’ve been around here recently, you know my love for Google Reader. I have friends in Gmail that use Gooogle Reader, but they never show up in Google Reader correctly when they share stories. 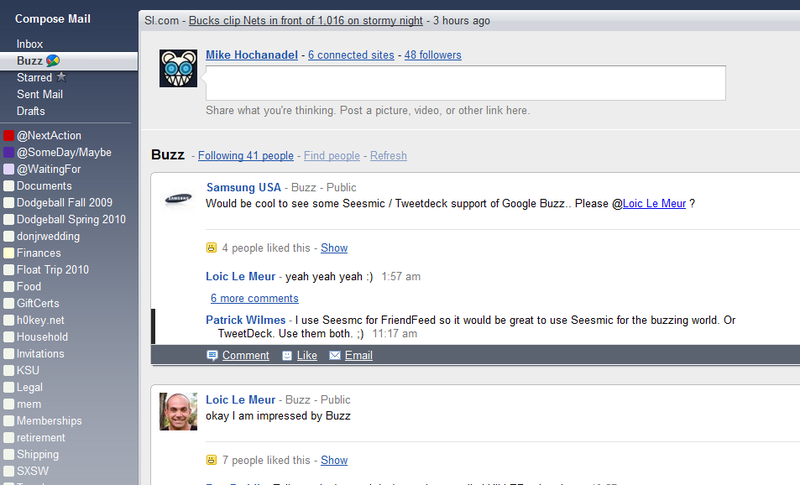 Buzz not only takes care of that, but also brings in Buzz users in to the Google Reader application. This makes picking up shared items that my peers curate much, much easier. Now, Google Buzz is not without its drawbacks. 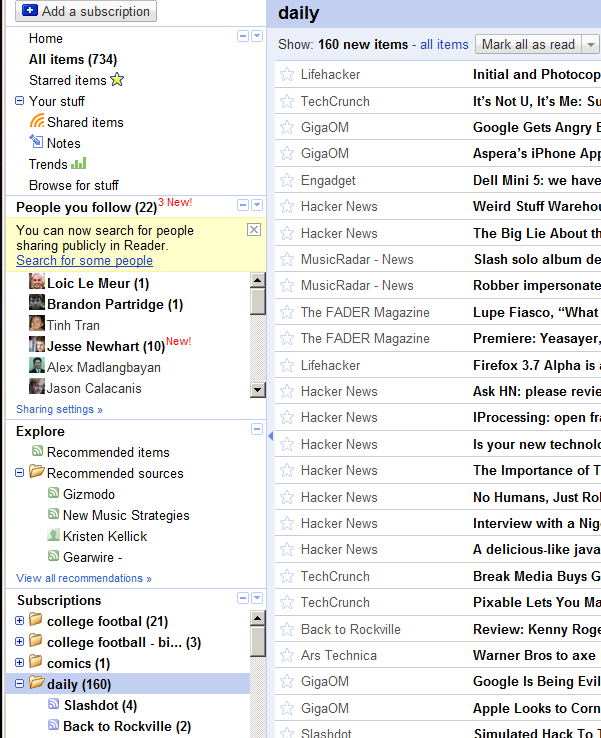 Everyone’s been complaining about privacy, but I’m starting to get bothered by the massive drag it brings to my Gmail. I’m an Inbox Zero cult follower and seeing new Buzz pumped in at an amazing rate is starting grate my nerves. I hope they follow through on pushing it out as a separate app. The folks at Google are already iterating changes, so if they are going to make a change, it will be fast. That said, Buzz is a great addition to my set of apps from Google I use. Not because of the app itself, but because it makes my other apps better. I’ve been using Google Reader as my news aggregator for some time now. Now some people might say that feed readers are dead along with RSS, but I beg to differ. It’s the best way for me to catch up on news using a uniform interface for easy scanning. If I want to go in depth, I can read the whole article there or open in a new tab. I had a hard time sharing any articles I find worthy of telling others about. The same thought leaders of today who say RSS is dead are the same ones who exclaim that Twitter is the king of up to second news. Until the middle of last year, there was no way for me to share links in a fast and easy way plus post it to my Twitter followers. Now I can with Google Reader’s ‘Send To’ feature.